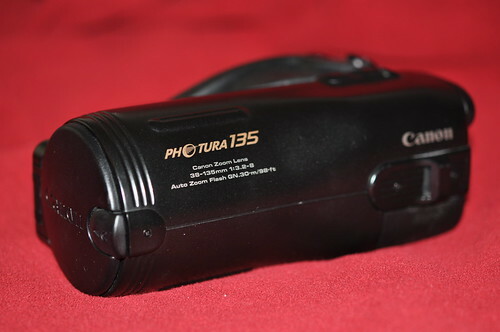 The Canon Photura 135 (Caption) was an updated version of the oddly-shaped Photura/Epoca model from Canon's very successful Sure Shot range. It was issued in 1992. This 35mm film camera was known as the Epoca 135 in Europe and Autoboy Jet 135 in Japan. It had a 38-135mm zoom lens, a powerful built-in flash, and the ability to add captions and dates. 3-point Smart autofocus (using 5-beam infra-red beam). Prefocus enabled. Lens: Power zoom 38-135mm f/3.2-8 (10 elements in 9 groups). Integrated flash. Guide number: 14-30 (at ISO 100 in meters). Power: One 6V 2CR5 lithium battery. Photura 135/Epoca 135/Autoboy Jet 135 in the Canon Camera Museum. This page was last edited on 25 September 2016, at 03:32.